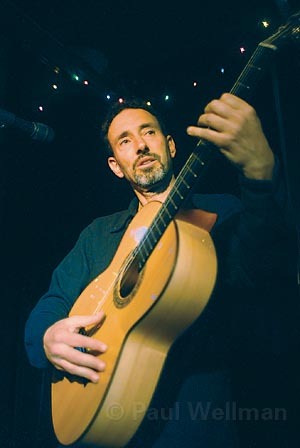 Jonathan Richman sang about many things, including Vincent van Gogh, Vermeer, New York in springtime, and teenage love. Although he pushed back the start time of this set until 9:30 p.m. because he plays so softly that he didn’t want to compete with even the minimal distraction of diners eating, Jonathan Richman nevertheless came through with one of the year’s most memorable performances on Wednesday night. For those unacquainted with this eternally eccentric rock ‘n’ roll genius, a short introduction is in order. As a teenager, Richman went to New York to meet Lou Reed and share his enthusiasm for what he considered the greatest album of all time, The Velvet Underground’s Loaded. After struggling to be heard in the tumultuous pre-punk scene of the early 1970s, Richman returned to his hometown of Boston, where he crashed a house party held by soon-to-be Talking Head Jerry Harrison and his Harvard roommate, bassist Ernie Brooks. The rest is rock history, as the group that came to be known as the Modern Lovers went into the studio (with John Cale producing) and recorded their eponymous first album in 1973. It didn’t come out until 1976, but when The Modern Lovers dropped, it became an instant classic, setting the tone for an era in which stripped-down, dark, and disturbing Velvet-style rock would emerge as the new punk. Richman, now 56, has evolved a great deal in the decades since his early triumph, but his music has lost none of its original heart and soul. Wednesday’s concert featured Tommy Larkins on drums and Richman on acoustic guitar. Most of the numbers were from 2004’s Not So Much to Be Loved as to Love, and Richman’s guitar playing was, as usual, delightfully inventive and idiosyncratic. On “Let Her Go into the Darkness,” Richman told the story of a lovers’ quarrel in four languages in succession, delivering priceless vignettes in French, Spanish, Italian, and last but not least, Hebrew. From the surprisingly sensitive “Vincent van Gogh” (this from the man who brought you the infamous “Pablo Picasso,” which rhymes the artist’s last name with a certain taboo body part) to “He Gave Us the Wine to Taste It,” a contemporary exhortation to “let it be,” Richman’s profoundly un-corny musical message was always the same-life only avails, not the having lived, so make today something you’ll remember.